Protecting 4,027 ha of tropical lowland rainforest at two sites on south Choiseul, Solomon Islands: Sassamungga and Boeboe. Protecting 2,407ha of lowland coastal rainforest. 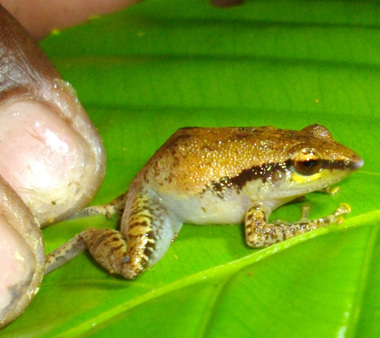 Habitat for 19 of the 21 frog species found in the Solomon Islands, with 11 identified in a rapid biodiversity survey in the project site. The forest is home to many bird species including: Midget flowerpeckers (Dicaeum aeneum aneum), Golden whistlers (Pachycephalus pectoralis), Song parrots (Geoffroyus h. heteroclitus), Crested cuckoo doves (Reinwardtoena crassirostris), black and white monarchs (Monarcha b. barbatus), White–billed crows (Corvus woodfordi woodfordi), Blyth’s hornbills (Aceros plicatus mendanae), Eclectus parrots, fruit doves, and lorikeets. Also present are Mackinlays cuckoo dove (Macropygia mackinlayi arossi), Willy wag-tails, and kingfishers. Choiseul has the highest number of native mammals including native giant rats, the Giant horseshoe bat (Hipposideros dinops). 14 species of reptile were recorded at the site including green bellied skink (Emoia cyanogaster), brown tailed copper striped skink (Emoia cyanura), and Pacific black skink (Emoia nigra). The mildly venomous Solomon red krait (Salomonelaps par) was also present. The saltwater crocodile is also abundant in the rivers closer to the sea. The project is certified to the Plan Vivo Standard and will generate 40,980 carbon offsets annually, with the first issuance expected in the first quarter of 2017. Scroll down to the section entitled "Follow the Money" for more pricing information. Children of Sassamungga and the Boeboe community. This project is owned by the indigenous peoples of the Sirebe and Vuri tribal groups at Sassamungga, and the Boeboe community. These indigenous landowners have voluntarily given up rights to logging in exchange for the opportunity to create and sell rainforest carbon offsets from their lowland coastal rainforests. The Sirebe tribal group have established a community-based organisation (CBO) called Elbar CBO. This CBO has established a community learning centre and visitor accommodation with two-way radio and solar panels. The desire to conserve the forest was initiated by the CBO and agreed to by the community. Their land provides their main source, and sometimes only source of food, income, medicine, building materials, water, and firewood. The Sasaboe project consists of two sites, and owned by three different landowning communities. Project development began in 2012. The project developed a Project Idea Note for registration with the Plan Vivo Standard in 2012. It has since been undergoing project development in preparation for the completion of the Project Description (scheduled for late 2016). The project applies an "avoided forest degradation" carbon accounting methodology - otherwise termed "improved forest management" where land use is changed from logging to long term forest protection. A forest inventory was undertaken during 2015 as part of the carbon accounting for the project. The project is projected to generate 40,980 carbon offsets annually with first issuance expected in the first quarter of 2017. The project will be audited by CPMA International (Sweden) using auditors experienced in the CDM and VCS Standards. Its carbon offsets will be issued by Markit Environmental Registry in London (the world's leading environmental registry). The Nakau Methodology Framework is a general methodology required for any project operating in the Nakau Programme - a Pacific Island rainforest conservation financing programme. The Nakau Programme (and its methodologies and protocols) was developed jointly by Ekos and Live & Learn International. The Nakau Methodology Framework covers project governance, Free Prior and Informed Consent (FPIC), financial discipline, benefit sharing, biodiversity and social impacts. The Nakau Methodology Framework was validated to the Plan Vivo Standard in 2015. All projects in the Nakau Programme are required to apply a Technical Specifications Module covering measurement, reporting and verification (MRV) of carbon benefit impacts delivered by a project. The TS Module applied in the Drawa Project is a carbon accounting methodology applicable to projects that avoid forest degradation: Improved Forest Management - Logged to Protected Forest (IFM-LtPF). This Technical Specifications Module was validated to the Plan Vivo Standard in 2015. The first step in project development is the preparation of a Project Idea Note (PIN) for project registration with the Plan Vivo Standard. The Sasaboe Project PIN can be downloaded by clicking on the document above. The next document to be released is the Project Description (PD) - a detailed proposal quantifying the benefits to be produced by the project once implemented. The PD is split into two parts. Part A General Description involves the application of the Nakau Methodology Framework to the project site. Sales & Marketing costs needed to monetize carbon offset units. We can provide wholesale pricing and project cost details for carbon offset resellers on request. This project was developed by the Nakau Programme Pty Ltd (jointly owned by Ekos and Live & Learn International). Technical support was provided by Carbon Partnership and WCS, with funding from the European Union. The project is certified to the Plan Vivo Standard and was audited by CPMA (Sweden).